Clarence is best known to the world—especially the business world—as CEO of Darden Restaurants, which owns and operates more than 1,500 restaurants in North America (Olive Garden, LongHorn Steakhouse, The Capital Grille, and others). He joined Darden in 1995 and served as CEO from 2004 to 2014. Before Darden, Clarence was managing director and manager of public finance for Chemical Securities, now JP Morgan Securities. He has long served on a number of corporate and nonprofit boards, and he has been honored with a Horatio Alger Award and inducted as a lifetime member of the Horatio Alger Association of Distinguished Americans. At Williams, Clarence is known as a member of the Class of 1977 and longtime dedicated volunteer: a former Tyng administrator, associate class agent, alumni trustee, and a term trustee since 2012, he has served also on the Society of Alumni’s Executive Committee and his 25th Reunion Fund Committee. He’s a member of the Williams Black Alumni Network steering committee, and he participates as an admission volunteer with the Windows on Williams program. As a student at Williams, Clarence majored in economics and political science and was elected to Phi Beta Kappa. He was a Tyng Scholar and a Junior Advisor, and he was a member of the Black Student Union, College Council, and the Gargoyle Society. He earned a law degree from Stanford University in 1980 and practiced law in New York City before beginning his career in finance and business. A native of Vicksburg, Miss., who now lives in Windermere, Fla., he moved with his family to the Watts section of Los Angeles at the height of the civil unrest of the 1960s. His father was a janitor, and his mother was a homemaker, and Clarence came to Williams at the encouragement of Felix Grossman ’56. A first-generation college student, Clarence is now part of a pretty big Williams family: his sister Deborah, her husband, another brother-in-law, and Clarence’s son Randall ’15 (one of three children born to Clarence and his wife Jacqueline Bradley Otis) are all Ephs. 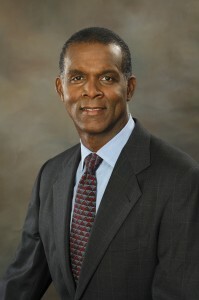 Williams has bestowed upon Clarence both an honorary degree (2009) and a bicentennial medal (2004).